On either side of the Grand Staircase inside the Legislative Building in the City of Winnipeg, Manitoba, there are two life sized bison statues. The Grand Staircase is three flights, each flight consisting of thirteen stairs which have been created out of brown-veined marble to blend in with the spectacular architectural design of the Legislative Building. 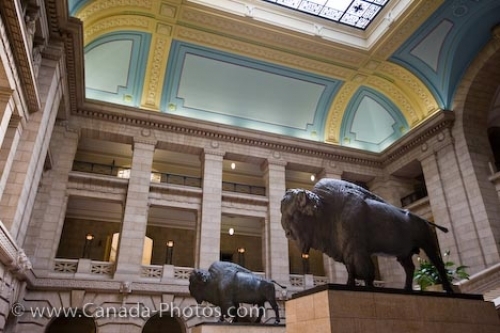 Picture of the two bison statues inside the Legislative Building in the City of Winnipeg in Manitoba, Canada. The bison is an important symbol in the Province of Manitoba signifying the sacred bulls which guard entrances to temples. When visitors tour through the Legislative building in the City of Winnipeg, they can view these life size statues for themselves. Two life sized bison statues at the base of the Grand Staircase in the Legislative Building, City of Winnipeg, Manitoba, Canada.